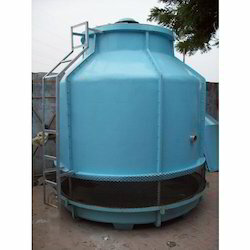 Prominent & Leading Manufacturer from Ahmedabad, we offer round cooling tower without basin, round frp cooling tower, cooling tower with basin round, frp round bottle cooling tower, frp round bottle type cooling tower and round cooling tower. 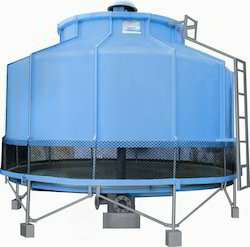 We are devotionally engaged in offering supreme quality Cooling Tower Without Basin Round that are widely demanded in international as well as domestic market. Understanding varied requirements of our esteemed clients, we are broadly engaged in offering an impeccable array of Round FRP Cooling Tower. With the assistance of our professional and experienced technocrats, we are engaged in serving with a superlative quality Cooling Tower With Basin Round. 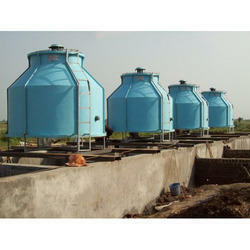 We are considered as a specialist in offering a wide range of FRP Round Bottle Cooling Tower. These work on the induced draft counter flow principle operation. In these towers, the fan vertically creates an air movement across the tower which is filled in opposition to the water flow. As water distribution is even, hot circulating water enters the water inlet headers and sprays through a nonclogging polypropylene spray nozzles. 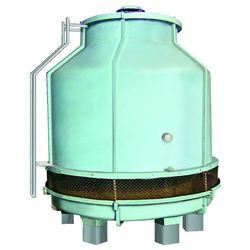 We are engaged in offering a vast range of FRP Round Bottle Type Cooling Tower. Backed by a team of highly devoted professionals, our organization is offering a wide range of precision engineered Rounded Cooling Tower Widely use for efficient cooling in various industries, the offered round basin is widely acclaimed for its matchless quality and long service life. In order to retain our grace in this market, we are offering a latest range of Round Bottle Shape Cooling Tower. Our offered product is hugely demanded in the market as it is manufactured by dexterous experts using standard quality raw material at our highly efficient production unit. Facilitated with ultra modern processes at our well established production unit, we are able to offer a comprehensive assortment of Bottle Shape Cooling Tower. The round shape FRP cooling towers also cafes as bottle shape cooling towels. The casing and basins are designed to withstand severe vibrations, high wind load and to resist corrosion. The cooling towers consist of honeycomb PVC fills in design that maximum economy and efficiency and directly driven fan and motor "minimum drift losses" uniform distribution of hot water by rotating arm sprinkler. Hot dipped galvanized hardware to withstand wind forces. The bottle shape makes possible to provide maximum cooling efficiency in minimum plan area with lower energy consumption. 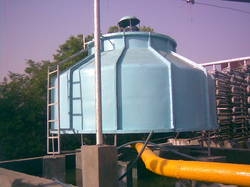 Round shape cooling tower that performs under induced draft counter flow principle for the operation. The hot water enters through hot water heat that passes through sprinkler by perforated branch pipe which distributes the water evenly. This water is spread over lite heat exchange pus. The water flows downward as a thin film through the fill in direct contact with ambient electrical labor fan air moving upwards in a counterflow direction.